After a few weeks off I'm back and ready for another year of excitement at the table. To kick things off (aside from the already posted latest EDITORIAL), here is the last three week's edition of the weekly recap. Mysterium: Dixit meets the classic family game Clue. Just the one play of this with 5 people on the middle difficulty. We (barely) managed to solve the mystery of the night's murder after some questionable clues from our ghost. A fair bit of set up involved in this game, but enjoyable nonetheless! Incan Gold: Slowly becoming a go to filler - especially when mixing in players who don't often play board games. I managed to score my highest (56 points) and lowest (0 points!) scores to date and found it an excellent choice to ease into the nights gaming. Escape: The Curse Of The Temple: Three games played and nearly three victories. With a dozen or so games under the belt now, it's just starting to feel like with some half decent coordination we can just about win this every time. Of course I've only tried the most basic game and will look to add a few new twists with the included expansion next time we play. Ultimate Werewolf: The most played game of the holidays. Introduced it to at least 15 new players and it was a hit EVERY time. Love this game even when I am just moderating and it would take ages to share all the stories from the last 3 weeks worth of games. I'm sure there will be at least 2-3 extra werewolf sales in the next couple of weeks.. Highly recommend this game if you have a large group of people to cater for! 7 Wonders: After at least a year of not playing, I was convinced into finally getting Wonders back on the table by some visiting friends (who I introduced the ways of Wonders to about two years ago! ), and I was not disappointed! Classic game, if you haven't yet tried it you really are missing out on one of the best card drafting board games. So many strategies and ways to win. Three games of six players resulted in finishing 1st, 5th and 2nd. Saboteur: Another go to game when looking for something quick, easy and fun for around 6-8 players. Pretty sure there was at least one new sale for this as I introduced it to 7 new potential saboteurs. Dead Of Winter: This edition of the weekly recap has a theme.. Every game we played I was able to introduce to new players as I wasn't playing with our usual gaming groups. Dead of Winter was a little hard for this group to digest, so while I think most saw the potential, it wasn't exactly a hit as I spent most of the game explaining rules over and over. There's actually more than I thought to digest and playing with 4 players new to the game made for a loooooong session. Camel Up: Just the one not very successful game of Camel Up. A new different group and I don't think any of them especially liked it so we moved on pretty quick. Everyone seemed to prefer rolling the dice over making bets - maybe I didn't explain it properly? Sushi Go! : The same group who didn't like Camel Up absolutely loved Sushi Go! I'll admit the first time I played this I wasn't that fussed (was early on when I would have rather played 7 Wonders) but with the positive response from the group, I actually really enjoyed our 3 games. It also helps when you win all three..
Hanabi: Capped off the Camel Up and Sushi Go! (all new gamers) with a couple games of Hanabi. Everyone enjoyed the challenge and I enjoyed playing with a fresh group who had no preconceived strategies making Hanabi feel new again. Average scores of 15 and 17 but happy with the results for this group! Roll For The Galaxy: Of course I couldn't go three weeks without playing one of my favourite dice rollers! Smashed out an easy win 58-43-36-35 but the bottom two scores were players new to the game. Think I've finally got a rough idea of how the strategy works so it's a good job I just bought the expansion. Betrayal At House on the Hill: I've only played this twice and both times the haunt has happened to me. Not that I mind at all, but after last time's failed attempt of VooDoo Dolls, I was hoping to be one of the good guys. That was until I brought the Mansion into the Abyss taking all four of us with it. Great cheesy horror game but it does seem to take us longer then the suggested hour. Codenames: The classic 'party' game that I've yet to introduce to someone who doesn't like it. Enter a couple new players with some experienced and two hours later we were well into the wee hours of a work morning before we finished. Great fun except I struggled to link Ivory and Pants causing our team overall defeat. Pretty sure I've heard of 'Elephant Pants' even though no one on my team had.. 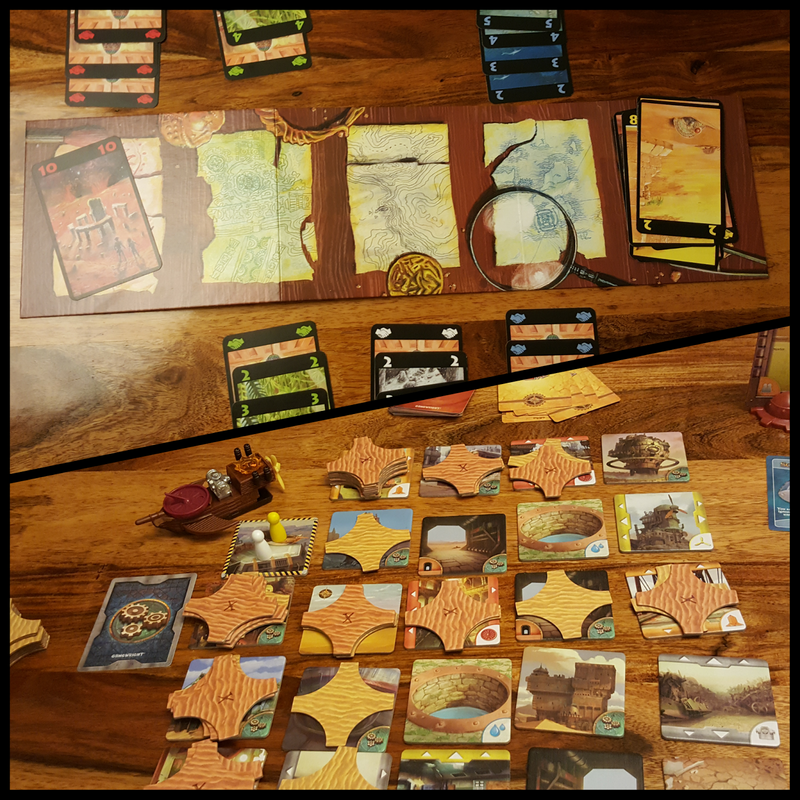 Forbidden Desert: One of the only two new games that I tried over the last three weeks. I like Pandemic, but after 17 games of Pandemic Legacy I think I've more than had my Pandemic fill until season 2 comes out. So I purchased this almost 'retheme' a while back and finally felt in the mood to try it. We started on he easiest setting just so we could learn it and get a taste for how it played. It resulted in an easy win and a desire to try it again with a bit more difficulty. Forbidden Desert feels similar enough that I don't need to own vanilla Pandemic to get my Co-Op fix, but different enough that I can play with the group who beat Legacy with me. Lost Cities: The other of the new games, this one was a recent purchase I had been eyeing for a fair while. It didn't disappoint! A quick two player card game, easy to learn and teach, but with a fair bit of strategy involved. There's the threat of running out of cards while your still hoarding high numbers waiting for those pesky small cards to show up, entering an expedition prematurely suffering negative points, and trying to figure out what cards you can play while you draw from the deck hoping for that one card you want! Some real simple mechanics on display here but they are presented in an excellent manner. Definitely will be playing this again. And as the long edition of the weekly cap yet I've decided to wrap it up there.. I'll include my boxing day purchases on next weeks write up. Happy gaming everyone!